It's occasionally nice to leave the high mountains and plant your feet squarely at sea level, which is where I have found myself a bit unexpectedly this week due to an emerging family situation in Seattle. With things more or less in control now (nothing serious, it seems), I've been able to work around doctor's appointments, pharmacy trips, and general household duties for a bit of running and a tad of running-related shopping. 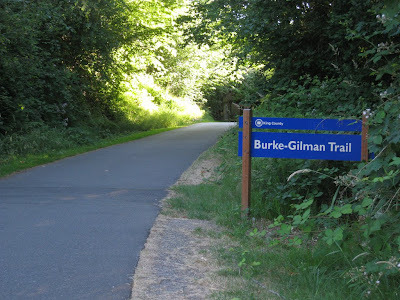 This morning I ran down to the Burke-Gilman trail right on the shores of Lake Washington and popped off 8 miles at a good tempo pace. What with injuries before my summer ultras and a few weeks of recovery after them, it's been a long time since I've really been able to air things out. But today was the day to do it. With my legs finally feeling fresh - and with the sea level boost - I pretty easily averaged about 7:30 per mile, with the final four a dash under 7:00. I know it's not fast fast, but with my recent slog-pace, it sure felt like it was. Getting to watch the sun rise over the Cascades made it all even better. I'd hoped to make it Cougar Mountain to see where all the Seattle ultra folk get a lot of their weekday miles in, but the doctors and the waning daylight hours didn't cooperate. Nearly as good, though, I made it to the Seattle Running Company at their new location (two doors down from the old location) and chin-wagged with White River RD, Scott McCoubrey, while trying on about 25 pairs of shoes, finally settling on the Inov-8 Roclite 320. I'd been intrigued with the green and black trail-only Mudroc 280s, but they just felt too darn strange for the upcoming winter road miles. What a great store, and what a great guy. So that's the report from my life at sea level. Hope to be back in the high mountain wilds of Idaho soon. Cheers.